The LashOut Electric Bike is one of the finest made electric bikes available. LashOut Electric Bikes have arrived and are currently shipping!!! !, Order yours today!! The 2005 LashOut electric bike is our high end full suspension electric bicycle and the ultimate performance vehicle. 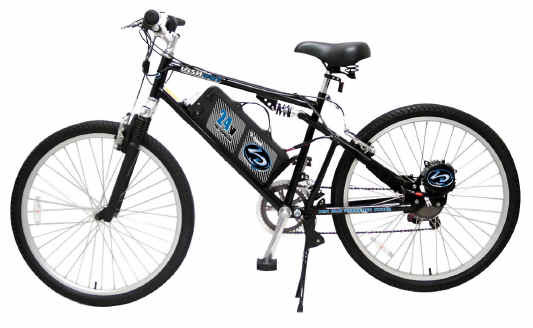 Its a 7-speed electric bike equipped with top-end performance equipment and our high-end high-torque 600 Watt motor. Combined with our 12 amp-24 volt battery system, this bike can reach speeds up to 18 MPH for durations as far as 20 miles on one charge. Get this high-end electric bike today and by the envy of your neighborhood. This is an UNBELIEVABLE deal!!!! The LashOut electric bike is the best quality electric bike that we have seen at an affordable price . Order yours today to guarantee delivery.